The new Occasions catalogue is coming up with all of it’s new and exciting products inside, and here’s a sneak peak at gorgeous new Tutti-Frutti suite. 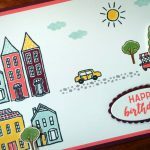 This suite combines cute images and vivid colours with simple stamping. 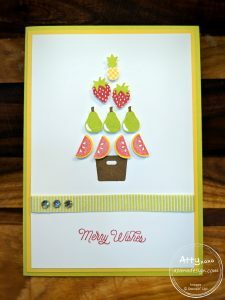 I’ve used the Fruit Basket stamp set and Itty Bitty Fruit Punch Pack to create this fruity Christmas tree card for my personal trainer – keeping it healthy over Christmas! He loved it. The stamp set images include a pineapple, strawberry, pear and a melon (it could be a watermelon, grapefruit or kiwi fruit or anything else you can come up with!). Each fruit co-ordinates with an itty bitty punch, oh-so-cute!! The basket or stump of the tree is from the Bookcase Builder stamp set and the Merry Wishes sentiment is from the Oh, What Fun stamp set. To make the grapefuit, I used Real Red and stamped off once onto scrap paper, then onto my Whisper White cardstock. The grapefruit has a Daffodil Delight rind. For the watermelon, in the tag on the left in the picture below, I stamped full strength Real Red and used Lemon Lime Twist for the rind. Here are another two little projects I made with the Tutti-Frutti Suite using the Designer Series Paper stack and Lemon Lime Twist Mini Striped Ribbon (which you can also see in my Christmas card). These cute little tags would make great gift tags on presents, or to use as card toppers. 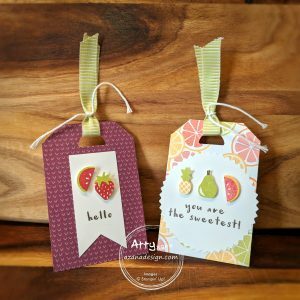 The sentiment stamps are from the new Fruit Basket stamp set which also includes happy birthday to you!, yay!, friend and we make a great pear (how cute is that!). 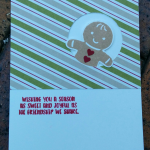 And did you notice the angled corners and “D” shaped hole for the ribbon on the tag toppers…? These were made with the little melon punch, very handy!! 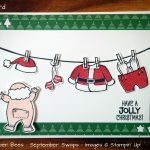 For another super clever way of using these little punches, check out Mitosu Crafts blog post, love it!